As Raph heads out into the storm to search for Ninjara, he’s attacked by a gigantic polar bear, which slaps him over the side of a cliff and knocks the Turtle unconscious. Meanwhile, Ninjara lies in a bed in a comfortable looking cave dwelling, where she’s attended by a jealous fox girl named Revyen. Revyen painfully checks Ninjara’s bandages, causing the fallen ninja to cry out in pain. Mokoshan rushes into the room and angrily tells Revyn to get out. In the morning, the storm has finally ended. Mike, Leo, Don and April emerge from their tents to find Raphael missing. The group heads out to find their headstrong ally. Raph awakes with a start and finds the Indian he had seen previously crouched beside him. The man’s name is Dave, and he asks Raph why the animal spirits are returning. Dave tells Raph that his people have been seeing many of them recently – the were-bar that attacked Raph, the Turtles themselves, and more recently, a walrus spirit. Raph explains that he’s no spirit, but he is seeking the wolf-people. Dave leads Raph to a mountain face containing two caves, and tells the terrapin that he’s not sure which will take him to Mokoshan’s village – the ninja will have to chose his own path. Raph angrily heads off, hoping that he’ll pick the right entrance to follow. Back at Mokoshan’s village, a funeral pyre has been prepared for the werewolf’s slain mate, Nei’sha, queen of the werewolves. The group lets out a mournful howl as Mokoshan lights the tower of sticks. The cry wakes Ninjara, who dons a robe and heads down to see what’s going on. She finds Mokoshan standing forlornly in front of the dying embers of the blaze. As Mokoshan explains who Nei’sha was, Ninjara begins to collapse, and the mighty werewolf helps her back to her room to rest. April and Mike find Raph’s sais and tracks, and the foursome follow the trail to the caves. Inside, Raph stumbles into a huge pack of wolves. Outside, Leonardo choses which cave to enter the old fashioned way – by doing the ole “eenie meenie minie moe” schtick. 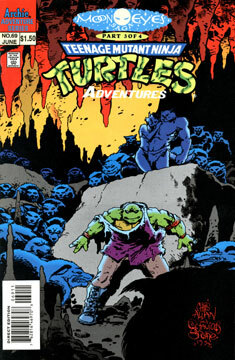 The Turtles draw their weapons and go in search for Raphael. Additonal Material: 5 page Inky (Tattoo’s pet dog) story by Gunther Jones, Eric Talbot and Jim Lawson.